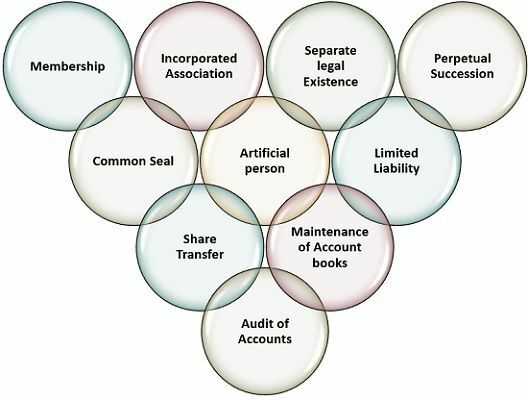 Definition: A company can be defined as an incorporated voluntary association of persons formed by law for a definite purpose, as an artificial person with a separate legal existence. Members: The persons who invest their money or money’s worth towards the common stock and whose name is listed in the register of members of the company are called as members. Capital: The money invested by members or raised from other sources is termed as capital. Share: The smallest unit, into which the company’s total capital is divided is called share. It decides the ownership of shareholders in the company. It can be equity shares or preference shares. Share Capital: It represents that part of the company’s capital, which is brought in, by the issue of shares. It can be authorised share capital, issued capital, subscribed capital, paid-up capital or uncalled capital. Further, the capital raised by the company by issuing debentures is termed as debt capital. Membership: To form a private company, minimum two members are required, whereas a public company can be formed if there are at least seven members. Further, the maximum number of members in case of a private company can be 200 only, whereas there is no limit on the maximum number of members in the case of a public company. Incorporated Association: It can be formed only by the operation of law. So, it must be registered under the Company’s Act, which makes it an artificial legal person. Separate Legal Existence: It is distinct from its members and, any changes in the membership of the company will not affect it. Hence, it can sue and be sued, come into a contract and conduct business in its own name. Artificial person: Although a company is regarded as a person in the eyes of law, it cannot enjoy the rights and duties, as are enjoyed by natural citizens. Perpetual Succession: It is formed with an intention, that it is going to last forever, irrespective of the changes in membership, insolvency/death/lunacy of any member. Therefore, nothing can affect the life of the company, and it can only be dissolved by law. Common Seal: As a natural person, a company is not able to sign its documents and so for this purpose a common seal acts as a tool to sign the official documents. In other words, the common seal indicates the official signature of the company. The officer authorised to affix the seal, has to sign the documents for and on behalf of the company. Limited liability: One of its most important features is the limited liability of the shareholders. This means each shareholder is liable to the extent of the unpaid amount on the shares held by him/her. In addition to this, in case of fully paid up shares, there is no such liability. Share transfer: Shares of a public limited company are freely transferable by the shareholders. As against, a private limited company has some restrictions on the transfer of shares. Maintenance of Account books: A company has to prepare and keep books of accounts and necessary documents, for each financial year, at their registered office or else they have to pay the penalty if they fail to comply with the same. Audit of accounts: On the recommendation of the board of directors, the shareholders appoint a chartered accountant, for auditing company’s account at periodic intervals. In addition to the above characteristics, there is democratic management in the company in the sense that people of various categories and areas invest in the company’s stock. They cannot look after the day-to-day operations and dealings. However, they participate in deciding the company’s policies. Hence, it is the Director of the company appointed by the shareholders, who manages the company’s affairs. Further, the shareholders have the right to access the company’s information. So, they can take part in the annual general meetings and also check financial statements.